JUST ANNOUNCED Winnebago Industries 3 year/100,000 mile warranty, that had previously been offered on all Winnebago Diesel Pushers through August 31, 2017 only, is now STANDARD on all Diesel Pushers. This extended warranty includes the following Winnebago motorhome models: Winnebago Journey, Winnebago Forza, Winnebago Tour and the Winnebago Grand Tour. At Winnebago, innovation isn’t limited to cutting edge products. They also lead in after sale service support. 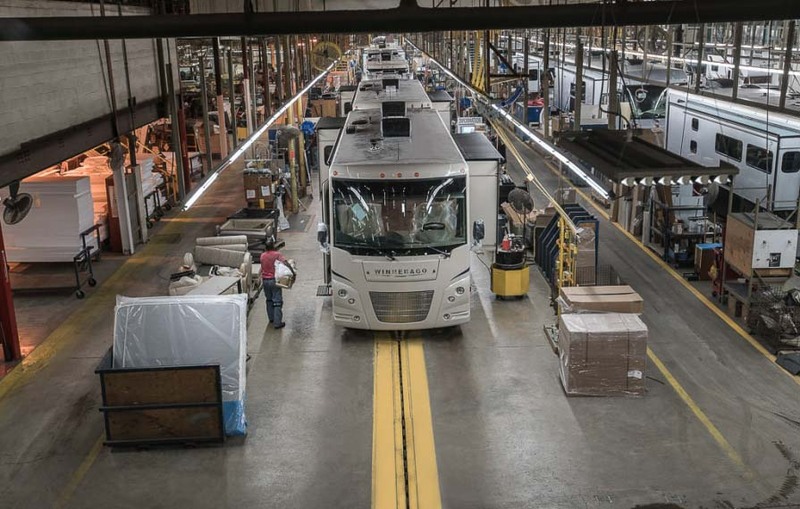 So while some manufacturers such as Tiffin District Service Centers are turning coaches older than 4 years away from their service facilities, Winnebago will be there for you today, tomorrow and for years to come. This program extends the warranty on our diesel pusher lineup — all built on Freightliner chassis — to an industry-leading 3 years or 100,000 miles, whichever comes first. Winnebago has always stood behind its products, and for anyone who is concerned about service, this program clearly demonstrates the confidence we have in our diesel pusher lineup! CLICK HERE to see a complete listing of our current in-stock new Diesel Pusher Inventory. Advantage PressurePro has been chosen as the TPMS provider for Winnebago’s line of Freightliner Maxum chassis offerings. The included models – encompassing the Winnebago Grand Tour, Tour and Journey models – will be gaining PressurePro’s market leading TPMS capabilities through their factory-installed XiteSolutions North America Inc.’s (XSNA) infotainment solution, arming users with a complete and integrated TPMS option. The integrated solution, distributed by RiverPark Inc., began rollout in early December and allows customers to monitor real-time tire performance information directly on their infotainment screen, both during travels and while parked. Fully customizable alerts allow users to set alarm triggers per their individualized needs, while wholly integrated alert capabilities allow warnings to be delivered not just on screen, but also audibly through the vehicle’s sound system. CLICK HERE to view our inventory of Winnebago Grand Tour, Tour and Journey models. If you are leaning towards purchasing a Winnebago Class A Diesel Pusher, NOW is a great time to buy, otherwise you’ll have to wait until late fall/early winter. Winnebago Diesel Pusher Inventory is limited now through late fall/early winter due to the announcement of the Winnebago Diesel Pusher product production being transitioned to Junction City, Oregon. Winnebago Industries announced plans for this change about a year and a half ago. As a guest interested in Winnebago Diesel Pushers including: the Winnebago Forza, Winnebago Journey, Winnebago Tour and Winnebago Grand Tour models are included in this production transition to Oregon. Currently, the Forza is still being manufactured in Forest City but production has stopped on the Journey, Tour and Grand Tour. We will not see any new Journey, Tour or Grand Tour units being produced until late fall/ early winter. After the announcement of the transition of production, Lichtsinn RV purchased the balance of inventory of the Winnebago Journey 36M’s and Grand Tour 42QL’s from Winnebago Industries. Also, a Grand Tour 45RL will be arriving at the dealership soon. Be sure to take advantage of the availability of color selection and content while we have a variety of interior/exterior options of these models IN STOCK NOW. In addition to taking advantage of the great assortment of these models, you can also take advantage of Carefree Diesel Days NOW – August 31, 2017. 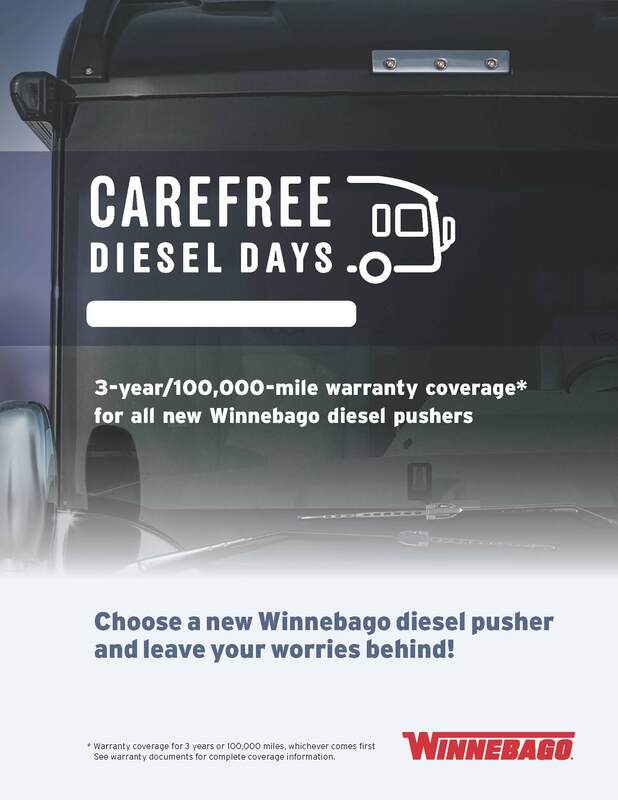 Carefree Diesel Days, is an extended warranty promotion for Winnebago Diesel Pushers! This program extends the warranty on the diesel pusher lineup — all built on Freightliner chassis — to an industry-leading 3 years or 100,000 miles, whichever comes first. Winnebago will be there for you, today, tomorrow and for years to come. Winnebago has always stood behind its products, and for anyone who is concerned about service, this program clearly demonstrates the confidence Winnebago has in their diesel pusher lineup! Take advantage of the availability of these Diesel Pushers here at Lichtsinn RV before they are gone! 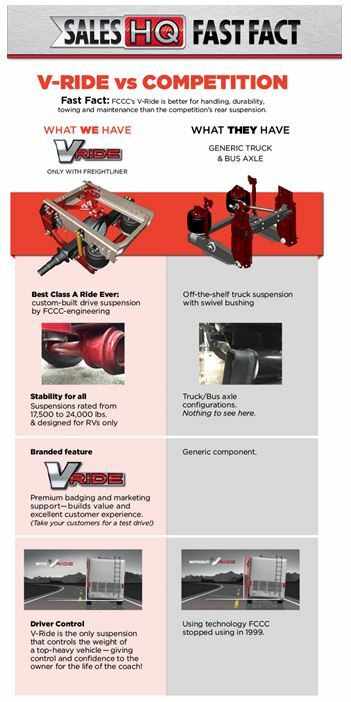 CLICK HERE to view our Diesel Pusher inventory or call us today at 1-800-343-6255.